Rodeo Drive Resale (http://www.shoprdr.com), premier reseller of upscale clothing and accessories, offers top Cyber Monday discounts on coveted brands including Louis Vuitton, Chanel, Christian Dior, YSL and much more. Save On Top Designer Fashions During The ShopRDR.com Cyber Monday Sale. Rodeo Drive Resale (http://www.shoprdr.com), premier reseller of 100% authentic discount St. John Knits, Louis Vuitton wallets, and Chanel handbags and other beloved handbags, offers fashion fans amazing deals on a wide selection of clothing and accessories just in time for Cyber Monday. Cyber Monday is a marketing term for the Monday after Black Friday, the Friday following Thanksgiving in the United States, created by companies to persuade people to shop online. The term made its debut on November 28, 2005 in a Shop.org press release entitled "'Cyber Monday' Quickly Becoming One of the Biggest Online Shopping Days of the Year". 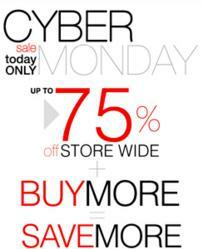 During this special event, shoppers can save up to 75% off all merchandise at shopRDR.com. While holiday shoppers stake out the local mall or area outlet store, shopRDR.com invites fashion fans to purchase quality pieces from the comfort of their own home, with deals that are tough to beat. At Rodeo Drive Resale, an online luxury resale store with over a decade in the business, shoppers can choose from an array of designer items that include handbags, shoes, jewelry, accessories and watches. Their clients, which range from everyday bargain hunters to high profile celebs, are guaranteed 100% authenticity on every item in stock, which store co-founder Raya Jaffer says equals guilt-free shopping. As the year inches closer toward the holiday season, Raya says searches of these brands will likely increase, with many top designers offering more reasonable prices to buyers hoping to build their luxury collection. “Expect to see the rise of the brand savvy shopper this holiday season, particularly when it comes to high-end fashion. Designers like Coach and Gucci, once considered elite fashion among midrange shoppers, have become much more affordable in recent years,” she says. Rodeo Drive Resale (shopRDR.com) has built a reputation of providing amazing deals on handbags, clothing and accessories from the top designers of upscale fashion. The company offers a 100% guarantee of authenticity on each item sold, and works daily with a network of clients looking to buy, sell, or for consignment of their luxury goods. ShopRDR.com loves high-end fashion, and believes finding a high quality, classic piece should be an easy, enjoyable -- and most importantly -- hassle-free shopping experience. For the finest in Louis Vuitton, Chanel, Prada, Gucci, St. John Knits, Christian Louboutin, Tiffany & Co. and more, visit RDR online at http://www.shopRDR.com or call 1-888-697-3725. Also find shopRDR.com’s blog at http://blog.shopRDR.com.